Hatters boss John Still admitted he is yet to play his first choice side at any stage of the season so far. 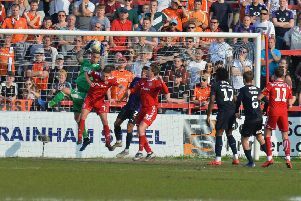 The Luton chief has seen his squad hit by a number of injuries this term, while some key players have struggled for form too. Still confirmed he knows exactly what his best 11 is and hopes to have a chance to use it on a consistent basis soon. He said: “From the start of the season I knew my team, I don’t think I’ve ever played my team. “I think I’ve been two players, sometimes three players away from playing it at any different time, playing it settled and giving it a chance. “We still haven’t, that’s just the way it is. In our Conference winning year until we got the injuries at the end of the season and brought Cam (Cameron McGeehan) in, and we bought Pelly (Ruddock Mpanzu) in, it was similar teams most weeks, hardly any changes. “Unfortunately when you get injuries and suspensions, there’s nothing you can do about it. “I thought after last week we would be very very close to picking what I’d like to pick, but we’ve picked up one or two injuries. “It would be nice as a manager to be able to pick this team this week, all the time, but we’re finding that really, really difficult to do. “Paul (Benson) came back in and showed us what he can bring, then he gets sent off and we miss him for three games. What can I do about that? “And he is an ingredient. Gutts (Luke Guttridge) came in and played a couple of games, then his hamstring flared up in the warm up (against Peterborough) so that’s a blow. Doyley (Nathan Doyle) is out, he comes in Sunday, we can build that up, but he’s not going to be quite right. “They’re disappointing when they are key influences, but every time that happens, we just have to say, what do we do now? Still hopes he is getting closer now, with the likes of Danny Green back to somewhere near his best, Craig Mackail-Smith over a hamstring injury and Pelly Ruddock Mpanzu back in training too. The boss also admitted he was surprised that his side were struggling in the league at this stage, especially after their summer additions too. He added: “We’ve got him back now (Mackail-Smith) and Benno back, that’s good, Green, that’s good. “I’d like to have Pelly coming down the other side and get Doyle back there too. Then that’s looking like what I’d like to repetitively play. “At the end of last season, we felt now was a time to have an overhaul, we’d come up, just missed out on the playoffs, now’s the time to strengthen, that’s my responsibility. “Not everything has fallen into place as I would have liked, did I expect it all to happen straight away? No I didn’t. Did I expect it to have happened by now? Yes I did.